Isn't it (and he) lovely? And it wasn't even supposed to be a hint! I already have a plan and am doing some prototyping before I go anywhere near these beautiful fabrics with my rotary cutter. On the cutting mat this week are the fabrics from a Tradewinds layer cake which are waiting to be made into a quilt/wrap for Sprog 2. I found the fabric moved together while I was sewing it, and I think this will necessitate a bit of squaring up, but it's certainly a very rapid way to make HSTs. Pinwheels had been my plan, but I'm veering towards a random placing now. I'm also not sure how well the bamboo lattice works with the rest in this project - do you think they'll stand out too much from a tonal point of view? - and wondering if I should unpick these triangles. Such a horrible job! Pretty fabrics - and I wouldn't unpick anything! Especially if you can add a few other fabrics to maybe blend with the lattices. As for the HST's, I'll bet you can find a way to change the tonal value of your quilt in other ways too; you can use this to the design's advantage! Is there a quick way to calculate what full sized square you need for X sized little squares? I love pinwheel blocks but I admit to DREADING sewing them together. That middle point gets so bulky! I like the lattice fabric in your blocks. Those rubies are gorgeous, what a good husband. The pinwheel layout looks beautiful I like it very much and the bamboo lattice complements the other fabrics really well. Yes I like the bamboo lattice as it gives less colour/design saturation on each half but you would see that better when laid out. What a lovely hubby. What a lovely hubby you have - I am so envious of that stack you do not know! awesome that hubby 'got it' you lucky girl! 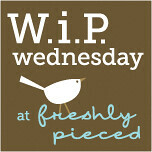 Thanks so much for linking up to wip Wednesday, where I am having a fun day guest-hosting!